Email: Thanks to everyone who wrote to us about the maps. We've had over a million hits on the web page and received so much email that we may not be able to reply to everyone, but we much appreciate all your comments and suggestions. Most of the things people have been asking about are answered in this list of frequently asked questions. 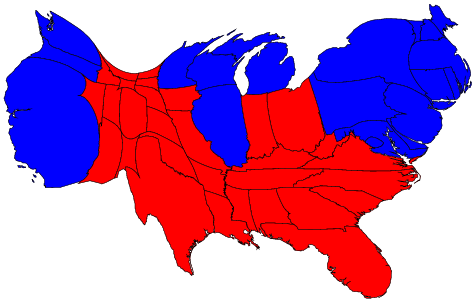 The cartogram was made using the diffusion method of Gastner and Newman. 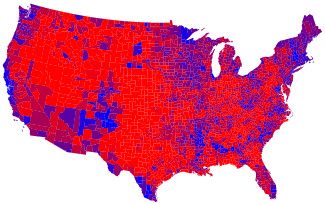 Population data were taken from the 2000 US Census. This cartogram looks very similar to the one above it, but it is not identical. 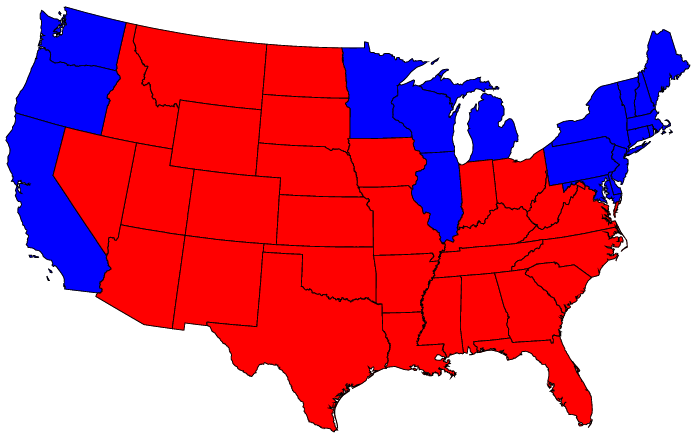 Wyoming, for instance, has approximately doubled in size, precisely because of the bias in favor of small states. 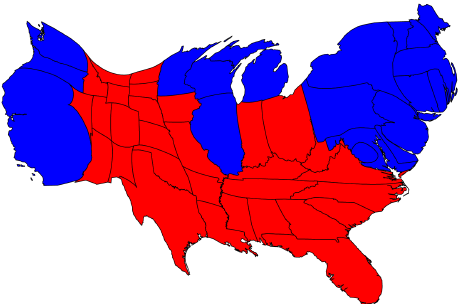 Again, the blue areas are much magnified, and areas of blue and red are now nearly equal. However, there is in fact still more red than blue on this map, even after allowing for population sizes. Of course, we know that nationwide the percentages of voters voting for either candidate were almost identical, so what is going on here? Finally, if you found the maps on this page interesting, you might be interested in this page also, which contains a collection of cartograms of the entire world, depicting all sorts of different things. It's nothing to do with the election, but it's worthwhile reading nonetheless. Frequently asked questions (FAQs): A list of frequently asked questions concerning our maps, along with answers, can be found here. Update: We changed the color scale on the purple maps to be the same as that used by Robert Vanderbei. The old maps are still available above for those who are interested. Wallpapers: By popular demand, all of the maps are now available in "wallpaper" sizes for your computer desktop. Click here. Correction: The colors of a few counties in Texas and in Delaware got swapped around because of differences in the alphabetizing of lists of election returns. This is fixed now on all the maps. Thanks to J. Henderson and S. Hughes for spotting the problems and letting us know. 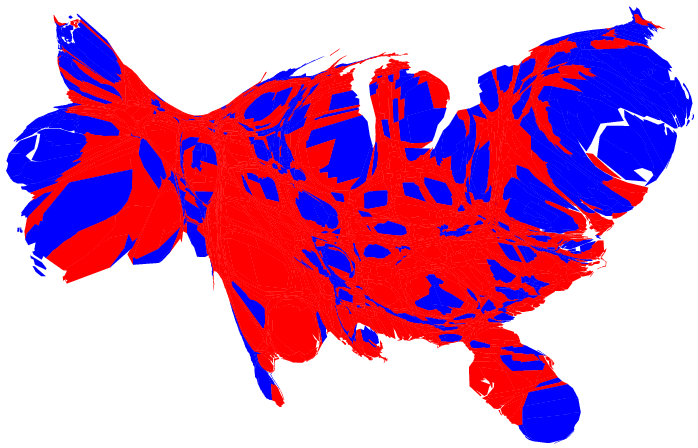 Update: We've added a cartogram with areas of states proportional to the number of votes they have in the electoral college. This work is licensed under a Creative Commons License. Text and images may be freely distributed. We would appreciate hearing from you if you wish to make use of our work. High-resolution versions of the figures are available here. Even higher-resolution ones are available on request from the authors. Our computer software to produce cartograms is freely available here.